As part of the changes following the Cambridge Analytica scandal, Facebook will shut down hashtag search via the old Instagram Platform API on December 11, 2018. The old API will be replaced with the new Instagram Graph API, which will handle hashtag search a bit differently. Following these changes, Walls.io customers will soon only be able to add Instagram sources by connecting an Instagram Business account and using the new Instagram business source option Walls.io offers. Existing customers will also have to manually migrate all their existing Instagram sources to the new Instagram Business source option. Unfortunately this migration process cannot be done automatically. The old Instagram API will stop working on December 11, 2018. We recommend that all our Walls.io customers migrate their existing Instagram sources to the new Instagram Business connection as soon as possible to ensure continued seamless operation of your Instagram sources through Walls.io. If the migration is not completed by December 11, Instagram posts will stop showing up on social walls. 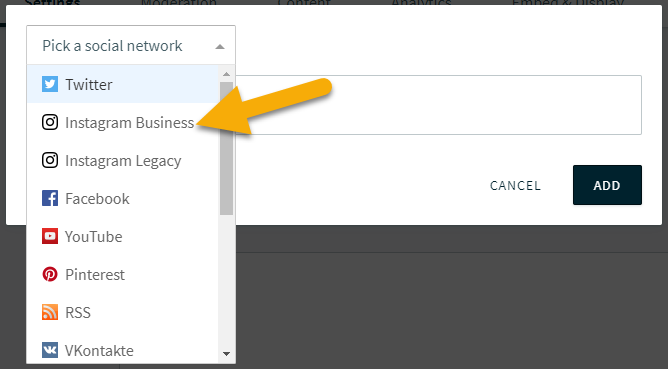 To make it easier for users to spot which connection they need, we have renamed the old Instagram connection to “Instagram Legacy”. We’ve put together a detailed guide on how to switch to an Instagram Business account, how to connect it to Walls.io and how to add sources using the new Instagram Business social connection. If you already have a personal Instagram account, you can easily switch it to a business account. Here’s a quick tutorial to help you with that. TIP: If you’re working in a team and have multiple Facebook pages and Instagram accounts, we suggest that you use the Facebook Business Manager to manage roles and linked Instagram accounts. There are plenty of other benefits for using the Facebook Business Manager . 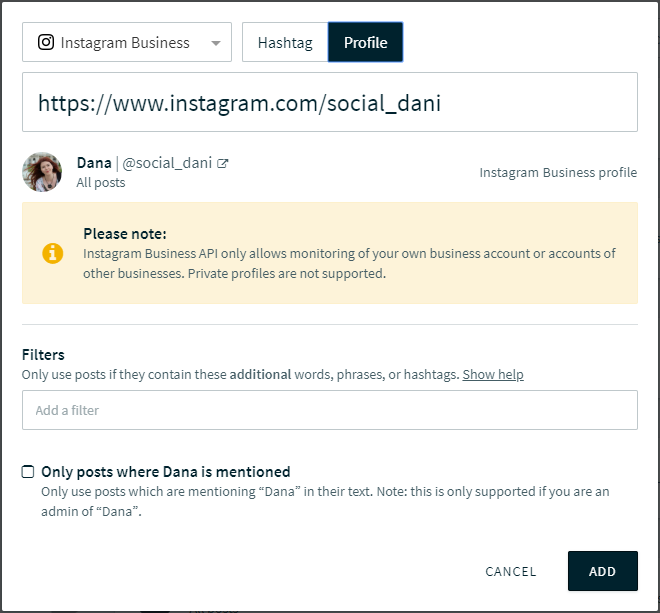 The new API requires that you connect your Instagram Business account to a Facebook business page. This process is offered to you automatically while converting your account to an “Instagram for Business” account. If for some reason this connection is not in place, you can set/change the link through the Instagram App as described in this Facebook help article. Please note: An “Instagram for Business” account can only be connected to a single Facebook page and, vice versa, each Facebook page can only be connected to a single “Instagram for Business” account. Log in to the Walls.io app, go to Settings > Sources, click the “Pick a social network” drop-down, and select Instagram Business. Add your Instagram Business profile URL and click the Connect button. Once your Instagram business account is connected to Walls.io, you will see a confirmation message at the bottom left. Once your account is connected to Walls.io, you can start (re)adding your sources. You can add two types of Instagram sources to your social wall: profiles and hashtags. 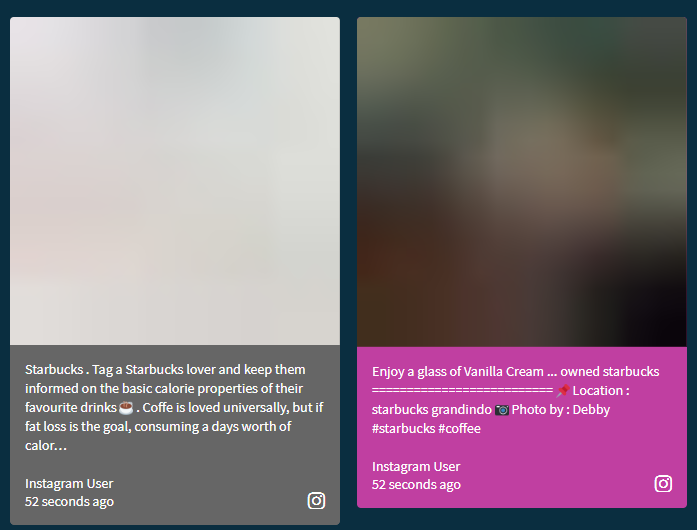 After you connected your Instagram Business account to Walls.io as explained above, you can add hashtag sources to your social wall. To do that go to Settings > Sources, click the “Pick a social network” drop-down, scroll all the way down and select Instagram Business. Click on the Hashtag tab and insert the hashtag that you want to collect posts for and click ADD. 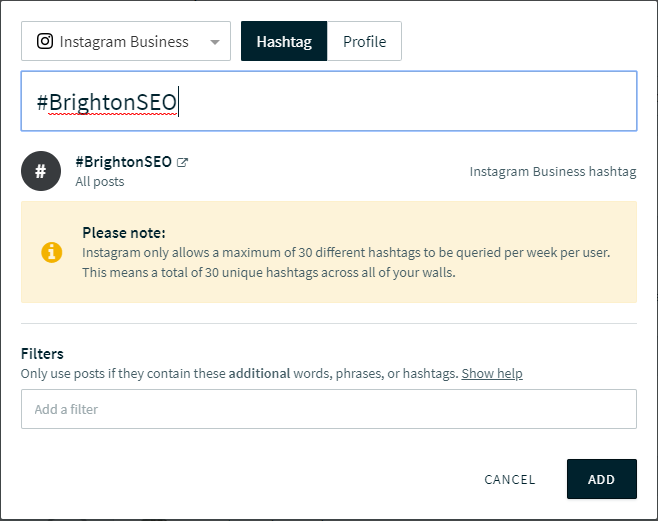 We can only fetch a maximum of 30 unique hashtags on behalf of any Instagram Business account within a rolling 7-day period. A hashtag will count against this limit as soon as it is queried. When you add a new Instagram hashtag source to your social wall, we will only fetch the public Instagram posts published with this hashtag in the past 24 hours. After you connected your Instagram Business account to Walls.io, you can add your profile as a source to your social wall. To do that, go to Settings > Sources, click the “Pick a social network” drop-down, scroll all the way down and select Instagram Business. 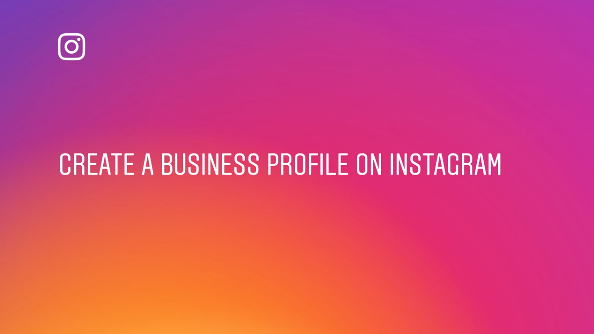 Click on the Profile tab and insert the URL of an Instagram Business profile you own and click ADD. 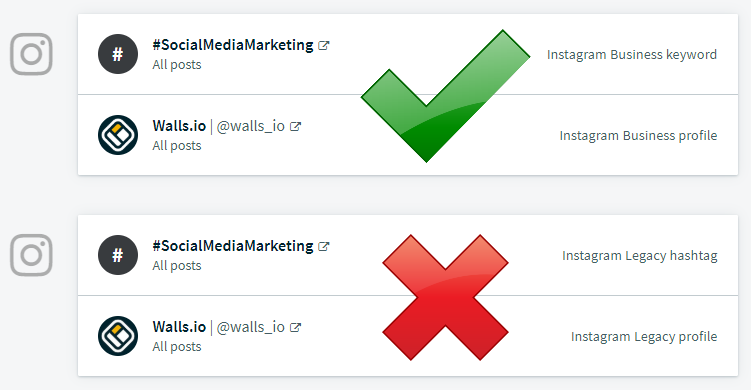 As soon as you migrate a source from Instagram to Instagram Business within Walls.io, we stop fetching posts from the old source to prevent duplicates. Still, to be on the safe side, we recommend that you go ahead and delete the old Instagram sources under “Instagram Legacy” once you migrated them to the new Instagram Business API. Even though we try our best to prevent duplicates, the only guarantee of a duplicate-free wall is to delete the old Instagram sources. After you remove an old "Instagram Legacy" source you will see a warning message regarding removing posts associated with that specific source. Please read the following information before clicking "Remove Posts". If you click the "Remove Posts" button after you've removed an Instagram Legacy hashtag source, keep in mind that all your old Instagram posts will be immediately deleted from your wall. Due to the new Instagram Graph API we are only able to fetch public Instagram posts that were published with a specific hashtag within the past 24 hours. So you can’t pull posts that were created further in the past anymore. The 24 hours limitation is only valid for the hashtag search. Profile sources can be fetched much further back.